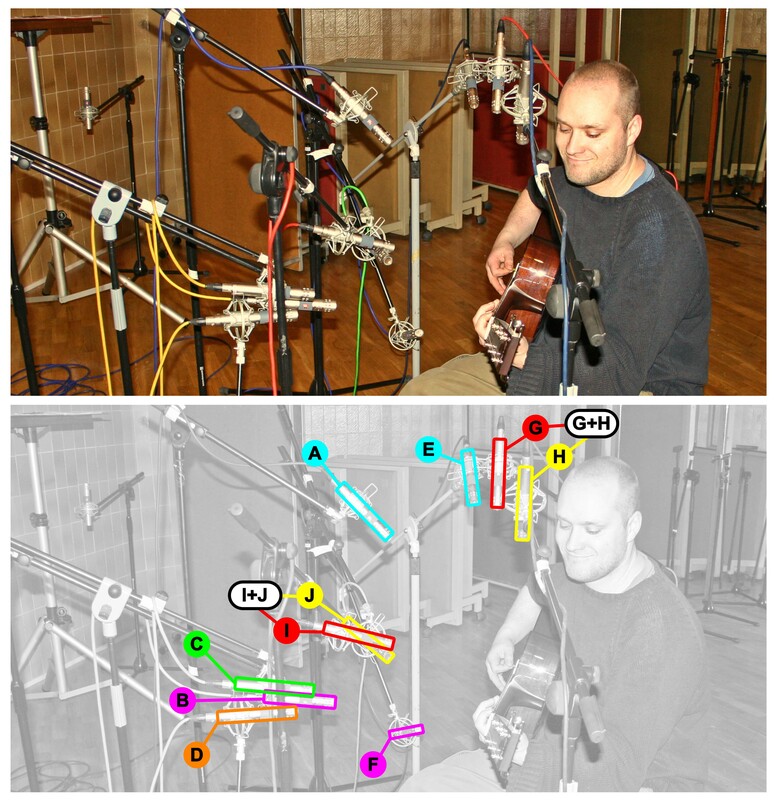 The following audio examples were recorded with professional guitarist Matt Harvey at London's renowned Livingston Studios using a set of SE Electronics SE4 end-fire condenser microphones kindly provided by UK distributor Sonic Distribution. 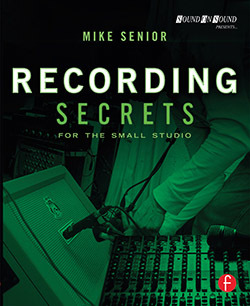 All the mics were recorded through the resident SSL desk's mic preamps directly into Pro Tools without any signal processing. The microphones were set up in the main wood-panelled live room of Livingston's Studio 1, and for each microphone setup we recorded passes with three different guitars: a Taylor ('Gtr 1'); an Art & Luthiere ('Gtr 2'); and a Huss & Dalton ('Gtr 3'). To allow easier comparisons, I'll present the mic signals from Multimic Setup 1 in smaller groups, each with its own diagram and audio-files table. Miking Distance: These examples show how miking distance affects the timbre captured via a cardioid microphone when addressing the guitar from two common miking angles. 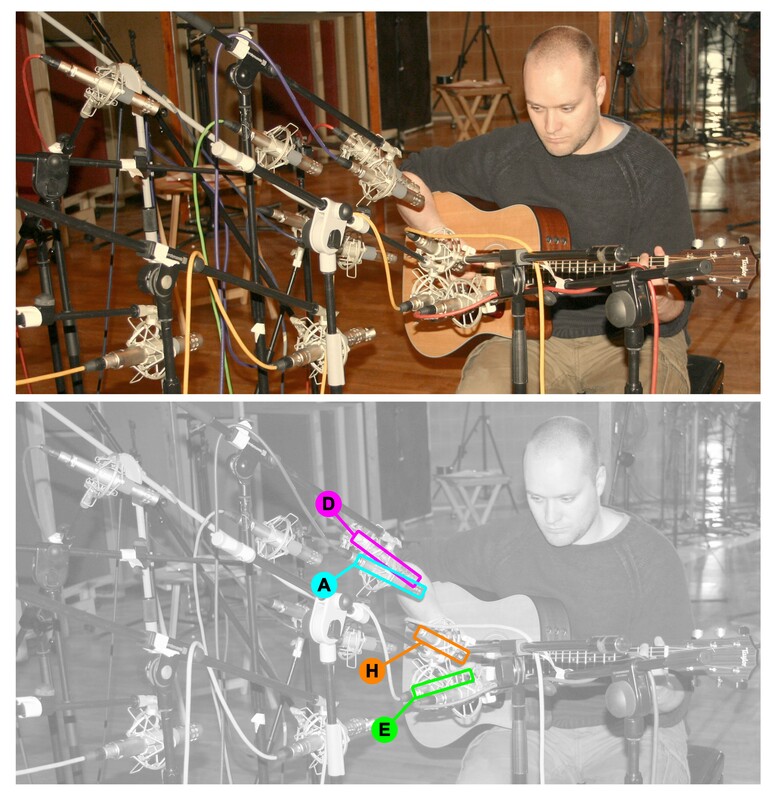 Spotlight Sweep (Horizontal): In these examples, a cardioid close mic is swept across the guitar horizontally (from bridge to frets) to show how different regions of the instrument produce different timbres. Spotlight Sweep (Vertical): In these examples, a cardioid close mic is swept across the guitar vertically in front of the guitar's sound-hole to show how the timbral balance changes. Cardioid Versus Omni For Close-miking: These examples show how the captured sound in two common close-miking positions changes depending upon whether you use a cardioid or an omnidirectional polar pattern. This microphone setup used 10 SE Electronics SE4 microphones all with their cardioid capsules fitted. The same three guitars were used, each one being recorded by all 10 mics simultaneously. Further Multimiking Options: These files demonstrate a variety of alternative mic positions you might consider when multimiking an acoustic guitar, and I've also demonstrated how two of the microphone pairs might be used to generate a bit of stereo spread. To hear the impact that phase relationships can have on a multimiked acoustic-guitar recording, import the WAV files into your DAW system and listen to how each of the tight pattern of mics 'B', 'C', and 'D' combine with any of the other mics.